It seems that the taste of fall sensed early in August is already setting the table for Thanksgiving – the equinox this year was a spot on marker of our earth’s annual cycle around the Home Star. Fall has already dropped heavily upon us…golden leaves dripping into fading gardens, heavier blankets needed on nighttime beds, although this week: back into October’s little summer. Unlike last summer’s unrelenting fog, this one was full of unrelenting sunlight. I’m not complaining! Some days, though, it felt almost oppressive – uh oh, another glorious day on the central coast that requires a happy face & joyful time spent outside. I’m thankful… really. But there’s one very special effect of fog that I always appreciate when it lingers for a few moments: being able to look directly at that sphere of a star, our own Opulent Orb: its overwhelming size (we’re so far away!) & its role, along with water, at the center of Life. I think that when you’re lucky enough to see the sun through fog (a state of water? a state of mind? ), you really have to pause & fix in your mind the location of your feet on this planet, & our collective circling around this fair star. Then, if you have the time, you can move your mind outward to this star’s age (about 4.5 billion years old) & its location in our home galaxy, & how many galaxies are out there that we can’t even conceive of, & on & on….if you have the time. When I have the time, looking at this muted orb stimulates involuntary deep breathing…for a few moments anyway – this visceral sun-fog viewing being always too fleeting. Today is my 63rd birthday – egad, as my father would say. Please, I’d really love & appreciate your warm wishes for this upcoming year – just whisper them to me in your mind (because sorry I’m not into tedious happy birthday posts on FB & elsewhere). 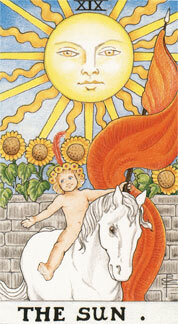 I’ve decided that my tarot card for this year is The Sun (because although we don’t take this too seriously – do we? – it’s helpful to have a mantra occasionally). I know, The Sun card is pretty mundane, but here‘s why: the sun will always bring another day (even, & especially, if it’s shrouded in fog). Call it “fogs of confusion” if you like. I’m sticking with the (not very original) notion that it’s foggy days that allow us to really savor the sun. This entry was posted in A Warming Planet, Just an Everyday Life and tagged aging, fog, fog of confusion, indian summer, Shmuel Thaler, sun as star, sun shroud, tarot, The Sun tarot. Bookmark the permalink. Happy Birthday, Linda. I hope the coming year brings you much joy and laughter. Liked your musings about fog, which I’ve always relished. Maybe it’s because I grew up in San Francisco, but I love the way it softens hard edges and cools the mind. Having technical problems today . Sent a happy birthday to your pacbell account but it came back . Hope you spend today doing something fun! I love your tarot for this year. thank you my friends, even though you violated my suggestion of a shrouded whisper. onward, as the world turns & circles.